How can we ensure that doctrine doesn't divide us unnecessarily? Student: Richard, this lesson is all about doctrines, and I come from a church where it's pretty much said that doctrines divide. So how can we study doctrine without that happening? Dr. Richard L. Pratt, Jr.: Well, doctrines do divide. I think that's just a reality that we have to admit in some respects is that they do divide, and sometimes necessarily and sometimes unnecessarily. But before I talk about that, let me remind us of what we're doing here. We are looking at systematic theology, and we have said that systematicians form technical terms that they use in propositions, and then they take those propositions and build them into doctrinal statements. Okay? So we're up here… we're at a very high level in systematic theology where they're accumulating data from the Bible and they're putting them into a shape that expresses what we believe about larger issues than just a single proposition — a little more complicated — and of course the more complicated a theological point of view is, the harder it's going to be to have people all agree on it. And I think that doctrines do divide sometimes. It's necessary at times when you're talking about the difference between true doctrine and false doctrine. Sometimes, though, we do, I think, go too far and emphasize the details of a doctrinal statement where we ought to be able to live and let live, let people just kind of fudge on certain things and not worry about it. But, unfortunately, as soon as people get into this, if they really believe it strongly then they, at least for a period of time, believe that everything is just as important as everything else, and then they end up dividing. And so the two of them go away and start their own church, and then they have a division between the two of them, too, because you can't get any two people in this world to agree on everything, and if you work hard enough, you're going to find a disagreement with every single person in the world. And that's just the reality. So we have to learn to adjudicate between things that are more important and less important and those kinds of things. If Christians all read the same Bible, why don't we all affirm the same doctrines? Student: Richard, it seems like if we're reading the same Scripture that we would come to the same conclusions, and yet, just think in the case of the doctrine of election, you have one church that teaches staunchly that we are elect before the foundations of the earth, and another church teaches that our salvation is based on our response. And it seems like there is a lot of fight over that issue. Dr. Pratt: Yeah. Well that's a great example, because the reality is you don't have to choose between those two, because the Bible teaches them both, and we ought to take pride in that and be happy with that. But Christians sometimes are just not willing to do it. You know, we always have to remember that the Bible is not clear about everything. It's only clear so that people with skill and without skill, learned and unlearned, that they can understand what is necessary to believe and to do to be saved. Everything else is just relatively clear or unclear. And we have to just live with that reality. In some respects… I mean, can you imagine, we already substitute the Bible for Jesus sometimes, and we still already substitute our theology sometimes for the Bible which substitutes for Jesus sometimes. And can you imagine if we had absolutely perfect doctrine, how much we would just get rid of Jesus completely? We wouldn't need the Bible either. All we'd need is our perfect doctrine. But we don't have perfect doctrine, none of us do, and so we can learn to let go of some of the things and to live with each other in harmony even if we disagree, if we can figure out ways of determining what's more important, what's less important, what's toward the center, what's toward the outside of our beliefs. But unfortunately, sometimes students, especially, can't do that. And sometimes I believe that it's almost a biological thing. You know, developmental psychologists tell us that there are stages that people go through in their mentality, and one of the stages is that of an ideology where you have to formulate what you believe is true. And a lot of times, younger students, especially seminary students, are at the age where they're doing that. It used to be earlier, it used to be 18, 19. Now it's a little more into the 20s because we delay adulthood. At least in my country we do, we delay adulthood. And so at 22, 25, 26, people are still formulating what they believe, especially if they've just come to Christ recently, and they can easily become so preoccupied with getting every single detail right that they just can't live with somebody else who doesn't agree with them on every detail. And that's the great danger. How confident should we be that traditional doctrines are correct? Student: Richard, if systematic theologians are guided by traditional Christian priorities and emphases, how can we be confident that those traditions are right? Dr. Pratt: Well, you can't. I mean, the reality is, in this series, we are not talking so much about how systematic theology ought to be done or even how it could be done. We're talking about how it is done, okay? How traditional Christian systematic theology has been done. And the course that has been set, and was set a long, long time ago back in the early Neo-platonic period, and then in the Aristotelian scholastic period, and then the modern period, they were set up for a certain priority, certain emphases. The fact is, is that when you start looking at doctrines, let's say, the doctrine of Christ — just take that as an example, Christology. Let's just isolate ourselves into that realm of Christology. How many things would you say the Bible teaches about Christ that we could emphasize? Student: Oh wow, there are many. Dr. Pratt: Like a million? At least 10,000 shall we say. Student: More than I care to count. Dr. Pratt: Yet, whenever you look at a traditional systematic theology, you're going to find the same basic issues discussed over and over and over again. You're going to be asking questions like, who was Jesus. And that's going to raise the issue of his two natures and one person, his human and divine natures in the one person of Christ, or the hypostatic union. So almost every systematic theologian that does it, traditionally, is going to talk about that. Then they're going to talk about his preexistence and his humiliation, and then his exaltation. Things like that. Then they're going to talk about his atoning work on the cross, and maybe occasionally you'll even get the resurrection stuck in there. But that's usually downplayed in traditional systematic theology because of the controversies of the church. All these kinds of things were determined a long time ago. And the reason I want to emphasize again that we're not saying this is the way it ought to be, we're simply trying to say this is the way it is. Now becoming aware that this is the way it is, allows you then the freedom of saying, well, should it be this way? Does it need to be this way? One great example of this is from the theologian B.B. Warfield. He has an essay called The Emotional Life of our Lord. Okay? Now, that comes under the topic of the humanity of Christ, but the reality is that you don't find that discussed typically in a systematic theology. The emotions of Jesus are just not there. And the question might be raised, why not? Instead, what you find is that Christology begins with Jesus as divine, then adds to it the concept that he is human and how those two natures relate to each other, and then his atoning work and so on and so on. But why do you think systematic theology almost always begins with Jesus' divinity, his preexistence, or his unity with God the Father in the doctrine of the Trinity? Why would you think that's true historically speaking? Student: That comes from the Neo-platonic influences, the top down theology. Dr. Pratt: That's right, exactly. And you know, the reality is that's not the only way you can do Christology. You could just as well do it from the bottom up. So you could formulate your whole doctrine of Christ out of the human being that was walking around on this planet, which is, by the way, the way the New Testament tends to do it. Okay? The New Testament kind of jumps back and forth, needless to say in the Gospels and that kind of thing, but its emphasis is certainly on building up to Jesus' messiahship and his divinity out of all these realities of his life, his empirical life as a human being. Is there a result to that? I mean, if you were take the traditional approach, can you see that if that's the only way you ever think about the doctrine of Christ that you might actually end up leaving some things out? Of course, because, what you're going to end up doing… because all systematicians have to face this fact, they are finite, they can't do it all. Okay? They can't do it all. And you can't say it all. So you start off really strong on the things that you emphasize and then you sort of taper away as you get toward the end. Then you say, well, the rest of it, I'm not going to talk about. So where a person chooses to start, and where a person sets priorities, also affects how much they talk about those things. And so we get the impression from systematic theology that the emotional life of Christ is not important, but the essay that B.B. Warfield wrote shows that it is extremely important to the gospel writers. That Jesus had pity on the hungry, that Jesus showed compassion to people, that Jesus wept, those are trivial things in traditional systematic theology, but not in the Bible. So you can see right away that a doctrine that's been formed by the church over and over and over again tends to get in a rut, as it were, and realizing that it's a rut and not just THE way to do it, becomes then an opportunity for us to ask the question, well, what's missing? What do we need to emphasize that hasn't been emphasized? And in recent history, that has happened… Thanks to the biblical theology movement, it's happened in the area of resurrection. We've mentioned many times Charles Hodge's systematic theology, a sort of a bid three volume thing, so it's a nice one to sort of pick at. But he has over 200 pages on the doctrine of atonement and only 20 pages or so on the doctrine of the resurrection of Jesus. Wow. Now why would that be true? It's because the controversy between Protestants and Catholics was not over the resurrection, it was all about the nature of the atonement. And so that became THE issue, and it has priority in Protestant systematic theology as opposed to the resurrection. And what people like Ridderbos and Geerhardus Vos, and other biblical theologians did, was they noticed that the resurrection of Jesus is just as important to salvation as the death of Jesus. And when you realize that in the New Testament that's the case, that if Christ died, as Paul said, and was not raised, then what good is it? The answer is: no good. We're to be pitied above all others. So suddenly the doctrine of resurrection started becoming emphasized, and it became more than it was in Charles Hodge which was basically an apologetic proving that the death of Christ was sufficient to pay for sins. That's about all he did with it. And so now resurrection is just as essential to salvation as the death was. So Christ pays for our sins, but now what does resurrection do for us? Well, resurrection is the fact that we are joined to Jesus in his death pays for our sins, but Jesus didn't stay dead. Jesus is the first man ever to rise from the dead in his glorified body and take the first step toward the world to come. The writer of Hebrews says, because Jesus has done that, we can be sure we will, too. He's the first fruits, and so connecting to Jesus' death and his resurrection seem to be just as important for the Apostle Paul, anyway, and other biblical writers. How might the church's expansion in Africa and South America impact its doctrinal emphases? Student: Well Richard, do you think that the emphases will shift now, now that the leadership of the church seems to be moving south — you talked about that earlier — into South America and in Africa. Do you think they'll change? Dr. Pratt: Well, it could. It could. Something like Christology will be reshaped. Clearly for groups that have suffered a lot, the suffering of Jesus will mean much more to them, and that entails emotions and the like. There does seem to be something about the Western tradition, the Western European, North American tradition of Christianity, that has sort of intellectualized things and sort of pushed emotions to the corner, so that the more academic you are, or the more intellectual you are about your faith, the less emotional you are. I mean, it seems that there is this correlation there, this inverse correlation. And perhaps, if people can hold onto their backgrounds in Africa, Latin America. Chinese? They can be very unemotional, too, though. This is a problem there. I don't know how that's going to work. But with this movement southward and eastward, there's also going to be much more impact from charismatic movements, because that's the majority of the churches in those areas of the world. And that's going to have much more of a sensitivity to the emotional, and hopefully so, because this is something that is missing from a lot of Western intellectual Christianity. And we have a lot to learn from them. We have a lot to learn from the emotional side which should be evident, if nothing else, from the fact that our whole life has become reduced to everyone going to a therapist to try to figure out what's wrong with themselves emotionally. And so just that reality should clue us in that maybe something is missing from our faith. And so that would reshape Christology in significant ways much more from below, as we say, from the experience of Jesus on the earth as opposed to the normal from above stemming from Neo-Platonism and Aristotelianism. I think that's probably true. How do systematic theologians' positive and negative goals impact their theological emphases? Student: Richard, in the video, you talk about how systematicians have positive and negative goals. Could you talk about how that impacts the different emphases? Dr. Pratt: Yeah, because it really does. I'm glad you brought it up, because it's really very important for us to understand that systematic theologians are not simply trying to find the truth that's in the Bible about any topic. I know that may sound strange in some respects, but there's so much truth in the Bible about every topic that that is not, it could not possibly be, the only goal that they have had as they have set the pace and set the emphases and the priorities through the centuries. Instead, the priorities have also been set by what I call a negative purpose or a negative goal, and that is to oppose false teachings. Let me just give you an example. I have it here. I want to read this statement to you about Christology. I think this will be a great example of that. If I can just find it here, let me see. Christology… listen to what is said about Jesus here, the second person of the Trinity. "The Son of God, the second person in the Trinity, being very and eternal God, of one substance and equal with the Father, did, when the fullness of time was come, take upon him man's nature, with all the essential properties, and common infirmities thereof, yet without sin; being conceived by the power of the Holy Ghost, in the womb of the virgin Mary, of her substance. And so that two whole, perfect, and distinct natures, the Godhead and the manhood, were inseparably joined together in one person, without conversion, composition, or confusion. Which person is very God, and very man, yet one Christ, the only Mediator between God and man." Okay, now. That's very deep, and it's also very different from the Bible. That's not to say that it's not true, and that it's not true to the Bible, but do you think those kinds of things are emphasized in the Bible? I mean, when you hear things like that he is one person with two distinct natures, the Godhead and the manhood, and they were inseparably joined together in one person without conversion, composition or confusion.. Those are technical terms that I don't think you find in the Bible. Student: Right, there's definitely not one spot… that's not in 2 Corinthians. That statement is not there. Dr. Pratt: Exactly. And in fact, what you have to do is piece together a lot of things in the Bible to come up with a doctrinal statement like that. Well, where did that come from then? Why in the world would anyone even imagine that what we need to talk about in Christology is the fact that Jesus is one person with two distinct natures and that these two natures don't mix, aren't confused, they don't convert, they don't shift back-and-forth, and all those kinds of things? Where in the world did all of that come from? Student: Probably a big conflict. Dr. Pratt: Uh-huh, big conflict, false teachings in the early church. That's where it came from. And so when you're dealing with one group in the church that says Jesus was not really human, he only appeared to be human, and you're dealing with another group that says Jesus was only human, he only became divine later. And you're dealing with groups that say, well, he was human part of the time and divine part of the time. And you have other groups that say, well, the two things were mixed together so they really can't be distinguished from each other. And this is what was going on in the early church. Then you end up with doctrinal statements like that. And even though today those words hardly communicate to anyone — the average person would not know what it means to say that the two natures of Christ are without conversion and without confusion, yes? So even though it has not been something that the church continues to be concerned about, it's part of the tradition because the priorities were set a long time ago. Frankly, I could think of a million things I would want to say about Jesus in a statement of faith about Jesus other than that his two natures don't convert and they're not confused, although I believe that. I don't believe that they do. I believe they remain distinct and that each nature keeps all of the attributes of the nature and so on and so on. And I think it's an important thing to remind people of now and then. I can think of a million other things that I would put into a statement. So the priorities and the traditions come both from trying to find what the Bible says, but also the answer the current questions. And systematics is so concerned with maintaining continuity with the past, that those questions keep being answered even when they're not being asked later on. Wow. I think that's very significant, because if you were to start asking questions about the nature of Christ and who he was, and what it meant for him to be human and divine today, you would probably have to reformulate the ways that you say these things. You at least would have to choose different technical terms, wouldn't you? Definitely. You see, they understood those technical terms because they were basically philosophical terms, and they had borrowed them from outside of the Bible for their day, and then they became a part of the tradition that moved forward that way. And so the negative side of what systematicians emphasize, the negative meaning that they are opposing, falsehoods, is very much a matter of the time in which these doctrinal statements were formed. Are traditional doctrines relevant to the modern church? Student: Richard, now are you saying, though, that these theological constructs are simply tied to a cultural situation? Dr. Pratt: Well, I guess in some ways I am. I am saying that the emphases and the priorities that are put on things in systematic theology often come out of the situations in which they were birthed. Before the ecumenical councils, a lot of these issues were not talked about. Then the ecumenical councils were called to deal with those issues, and then they became part of the tradition. Now you wouldn't want to reduce everything that the systematicians say to just their own cultural day, but they do obviously have emphases that come from where they are, what questions their cultures are asking. This is one of the reasons why Catholic and Protestant systematicians are so different, because once that controversy took place, once the Reformation took place, all of a sudden, every issue is now slanted toward that controversy one way or the other, depending on which side you're on. And so I just think that it doesn't mean that we throw it away because it's tied to historical circumstances, and, in fact, in many respects, traditional systematicians look back at those things and ask the question, what's the value of those earlier discussions for today? That would be more what I would want to say. What can we learn about the hypostatic union — the two natures in one person — what can we learn about that for today? Why would that be significant for us today as opposed to why it was significant for them back them? And sometimes it can be very similar, but sometimes it can be very different, too. How does the metaphor of a brick wall for systematic theology relate to the web of multiple reciprocities? Student: Now Richard, in the video you talk about building a systematic theology like building a brick wall. But then elsewhere in your teachings, you talk about or use the phrase, "webs of multiple reciprocities." Can you relate those two together? Or do they relate? Dr. Pratt: Well, they are two different metaphors. I could come up with a third one which is a liquid metaphor that I use sometimes to talk about how our beliefs work together. Basically, you know, every metaphor is deceptive. Aristotle said that because the thing you're talking about is like it, but it's not exactly like it. So the wall building is just to give the idea that theological technical terms are small items that are engulfed in larger items called theological propositions — larger things, doctrines — and then the whole edifice would be the whole system of theology. The idea… that's an easy one, because we use that kind of thinking a lot, you know, from small bricks up to the wall up to the whole house. The more difficult one is this idea that all beliefs form webs of multiple reciprocities. And let me talk about that just a little bit. 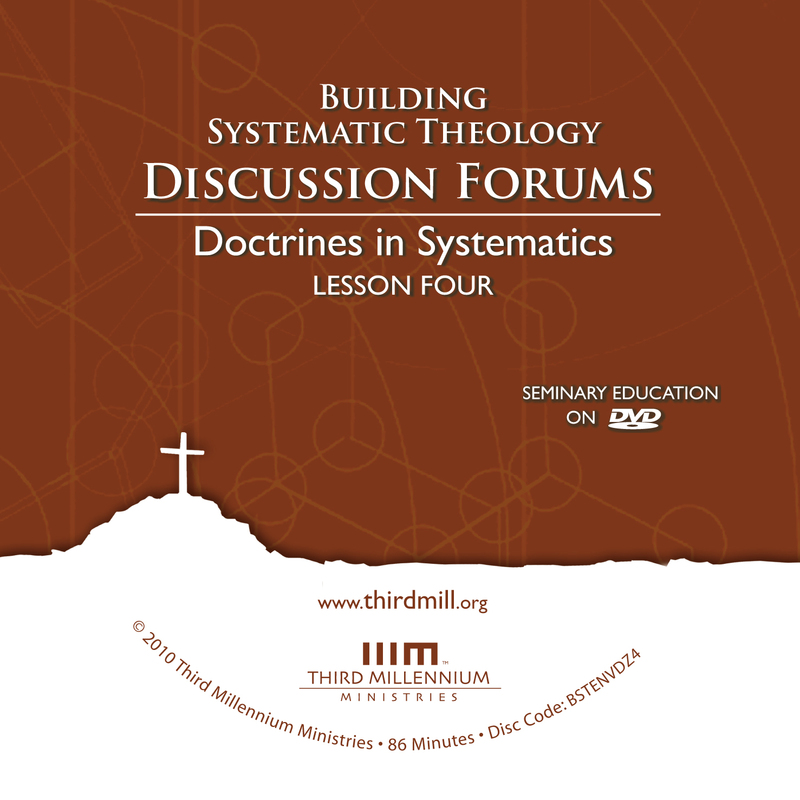 This is important because when systematic theologians form their doctrines, whether they realize it or not, or whether they're doing it explicitly or not, they are pulling from all kinds of directions to formulate this one doctrine, and doctrines are not in isolation from each other. And the idea is that you may have this set of beliefs over here and this set of beliefs over here, and they relate to each other in reciprocal ways. Now what you believe here affects what you believe over here, and what you believe over here affects what you believe over here. And in reality, systematic theology, the doctrines of systematics, connect to each other in so many different ways that you could not write about it. It would be just almost impossible to summarize all those interconnections. And so what systematicians do is they tend to just isolate maybe one way in which something connects to another, or several ways, and they limit that. And that, of course, is a little bit artificial because in the Bible itself, all these beliefs kinds of form these webs that have these impacts on each other, the nodes of which have impacts on each other in so many ways you cannot even count them. So this is to say and to reemphasize the idea that you don't just have one way in which you can make a doctrinal formulation. The doctrine of God is not simply settled when you deal with the Trinity. The Trinity is a way to do that. It's a very important way, and is something that we all ought to believe, but it is not the only thing that needs to be said about God, or even the relationship of God the Father to God the Son; there would be other things that can be said as well, because all these different beliefs that we have from the Bible impact that one belief. So one doctrine is impacted by all doctrines, and all doctrines are impacted by the one doctrine as you center attention on that one. And so obviously then, systematicians have to set limits on what they're going to do, and that limits then the value and the importance of any particular doctrinal statement. I mentioned the liquid. The liquid is also trying to illustrate the idea of how one set of doctrines affects another, how one set of beliefs affects another. So you can think of a bowl having white paint in it and you pour blue paint into the white paint, and what you're eventually going to get, especially if you stir it just a little bit, is shades of light blue, various shades. Why is that? It's because this belief we have over here and the first belief that we were thinking about mixed together and to the point that they are almost indecipherable, they can't be separated. And that's the way our beliefs, every day in life, this is the way we live with the things that we understand, the things we know, the things we believe. They intermingle like this. And when you're writing a systematic theology, the tendency is to take something that's intermingled, organically connected, and split them apart and isolate them from each other, and it makes it just a bit artificial. And I think we just have to say that. But that's the nature of life. We do that with everything. Every time you describe anything, you are in some respects making an artificial summary of it that leaves a lot of things out that you don't even sometimes realize you're leaving out. Student: Yeah, I found that last analogy really helpful, because when I'm sitting down looking at, you know, a systematic theology text book or whatever — going through Berkhof, let's say — it's really confusing. And so the whole idea of being able to break it apart makes it a little less overwhelming. Dr. Pratt: That's right, that's what it does. And that's the value of systematic theology, is you break it down. But you mustn't get caught in it, and I guess that's really the emphasis that I want to give, that the traditional emphases, even the traditional topics, the way they break down the topics and the priorities they give to them, is not necessarily the only way it can be done, and I think that's the value of realizing these different models for what systematic theology is and how doctrines relate to each other. How can we do systematic theology if we aren't trained in logic? Student: Richard, you say in the video that systematicians rely on the Bible and logic. What about those folks who really don't know a lot about logic? How are they supposed to interact with that? Dr. Pratt: That's a huge problem, isn't it, because… let me just say first, it is true that systematic theologians in that traditional vein are not just concerned with the data of the Bible. What they want to do is, and they feel that it's their job, to connect the various data points of the Bible that they've gotten from factual reduction of Bible verses, to connect them to each other logically. Now that stems, as you remember, basically from scholasticism because they championed that. Aristotelian logic, the purpose was to make everything fit together and connect everything logically. And it's a problem, because sometimes when people are not aware of what's happening, they are sometimes fooled, as it were, into thinking that the implications that are being drawn from the Bible, and the inferences that are being made, are just as solid as the Bible itself. And that sometimes isn't so, because human logic has limitations, and no matter how much we want to exalt it, we all know that logic has limitations and that there are different forms of logic historically. And how one thinks about logical reasoning affects then what deductions and the like, and implications you draw from the Bible. And so it's a big problem. I don't suggest that people go out and buy a logic textbook and try to figure out logic, because the reality is that you have to study logic an awful lot, a huge amount, to ever get to where you can actually handle what these people are doing with these things. But just to take a simple example of this, if you start off with this proposition that we mentioned in the earlier lesson that all have sinned and come short of the glory of God, if you're not careful to get the fact right, you're going to be able to draw off all kinds of false implications from it. Because the fact is, not that all have sinned and come short of the glory of God, but that all but one did. Well, that really is a sort of refinement of the proposition, bringing a lot of biblical data together — so you've got to make sure that your data is right — and sometimes we mess up even at that level. But then, at other times, we sort of reason our way through from one or two propositions into all kinds of implications, and I think that sort of the practical guideline is this, it's that if you're inferencing takes you to the point where you realize, whoops, I'm contradicting something else in the Bible, then you back off. And you can do that very easily. You can very easily come to the point of saying something that is contrary to the Bible. For example, if we believe, as the Bible says, that God is sovereign over everything, that he is in control of everything, then it would be only reasonable to infer from that that human actions are insignificant. If God is in control of everything, then what you and I do is insignificant, and we would end up with something like Plato's cave where human actions are just shadows on the cave wall and they're not real, they're just sort of the appearance of reality. But as soon as you draw that inference from the sovereignty of God, then you've contradicted what the Bible says, because the Bible is very clear that human choice, human effort, human desires, human actions are extraordinarily significant. Student: It'll also take you down the wrong path or wrong conclusion in the discussion of prayer. Dr. Pratt: Absolutely it will. Exactly. Precisely. Because if, for example, a person says, well God is sovereign and God already knows my prayer, so why should I ever pray since he's just going to do what he wants to anyway? Well, that would be a wrong conclusion. Okay? Well, how do you know that? It's not by judging the logic itself, because to get at that is a very hard thing to do. Because really what you want is a logical argument that entails all the data of the Bible as its premises. Good luck. If you did that, if all the premises of the logical argument included all the data of the Bible, then you'd never go wrong. Okay? But we don't do that. What we do is we start our logical thinking about something based on some of the Bible, and then we start reasoning, reasoning, reasoning. And for some distance, that's okay. But eventually what you're going to do, you're going to bounce into another doctrinal statement of the Bible that you'll be contradicting. And when that happens, you have to back off. And sometimes, of course, we're just left sort of in mystery not being able to figure out exactly how those things work together. But I know some people, for example, who think this way: Okay, God knows everything, and he even knows my prayers, so therefore prayer is not really an attempt to get God to do something, it's really an attempt to change me, because God already knows everything so we're not going to change him. What we need to do is just change ourselves. So they reduce prayer down to self-reflection and self-motivation and self-renewal, and things like that, okay? And then they feel very satisfied, except that that's not what the Bible says. The Bible does not say in James the prayer of a righteous man changes himself. That's not what it says. It says that the prayer of a righteous man availeth much. Okay? It gets God to do things. And that truth has got to be factored in, and if you can't factor it in at the beginning to control where you're logic goes, then you have to factor it in at the end when your logic starts taking you places that Bible says no, no, no, no. And I think that's the practical reality for people, even those that haven't study logic in any serious way. Student: So Richard, then is it possible for us to just create a series of syllogisms where we start with the text, but that we just end up somewhere else? Dr. Pratt: You can end up on another universe altogether. This is why you have so many cults, so many Christian cults, because what they'll do is they'll take a piece of the Bible and they'll reason from that way out here and not pay attention to the rest of the things that the Bible says. And so they're taken way far away from the Bible's teaching because they haven't taken at the beginning enough of the Bible into account, and they haven't allowed the Bible constantly to guide their logical reasoning from it. And I think that that's just the reality of what people face these days. And we have to be careful as we go through the practical steps of developing a doctrine, both to try to begin with as much as we can handle of the Bible and then to allow what we haven't handled at the beginning to come in and sort of direct our logical inferences as we go through the process. And that's a constantly renewing thing; we can't do it all at once. How do we handle statements in Scripture that seem to be illogical? Student: So Richard, what should we do then when we come across a statement or statements in Scripture that seem to be illogical? Dr. Pratt: Well, we do it. That's one thing, and we have to admit that. I mean, there are things in the Bible that don't seem to fit together, very neatly anyway, logically. And I think in terms of practice, what we have to do is first sort of recognize that the human mind is limited. As Isaiah says, you know, that God's thoughts are higher than our thoughts as the heavens are above the earth, and so we shouldn't expect ourselves to be able to get it all, and we need to sometimes just simply live without the ability to make logical sense out of everything. But there are certain kinds of practical steps we can take. Sometimes people find these kinds of illogical things in the Bible when they're really not so illogical. In our day, especially, people are more prone to accept things that sound illogical, and that's just part of our culture at this point, the world is coming to that point, I think in large part because life is confusing and is so complicated. So they sometimes just give up. And a good example of that would be people walk around these days saying, if they're Trinitarian, they think that the doctrine of the Trinity says God is three and God is one. Well, it doesn't say that. It makes a distinction between the sense in which God is one and the sense in which God is three. Because the early church fathers were not interested in talking about illogical things, they were very concerned about the logic of these things, so God is one in essence or substance or being, but three in persons. There is one "what" of God and three "whos" of God. And I think that's an important distinction. So sometimes the distinctions that theologians have made are very good and very helpful, and people just don't know them. They have a propensity just to sort of give up and just say, yeah, three in one, I don't know what to do with that. Okay? Other things, however, don't relate so much to God but relate to the creation. And this is where I will differ with some people, because a lot of theologians will say, yes, there are things about God that don't seem logical, but they'll say that things that deal with the creation are all very logical. Okay? Well, I'm sure that we can make more logical sense out of the creation than we can God. I'm sure that's true because God is so far above us. But I think personally, I'm convinced that life itself, or life in this world, is so complex that we meet the limits of our reasoning ability even when we're dealing with created things. I mean, for example, how can I be the same person today as I was yesterday when I have changed so much between yesterday and today? Or how can I be the same person who seven years ago lived when every cell of my body has been replaced over the period of seven years? And, you know, I don't know the answer to that. A lot of people will say, well the reality then is that you're not the same person, and in fact you're a different person every moment, and so certain psychological theories these days have to do with the fact that people are different people every single moment, and so you're not really who you were in the past anymore and da-da-da-da. And I can't buy that because there's continuity between me and the past, but I can't put my finger on exactly what makes me the same person as I was before. And I would probably challenge anyone that tried to do that, in some way, to show them that probably what they're saying is a little bit inadequate. But that's one of the mysteries to life, it seems to me, just one of the things that I just can't make sense of. Sometimes, however, the Bible seems to be illogical because the statements of the Bible are not supposed to be taken as universal truths, but they're supposed to be taken as situational statements. So, for example, when Paul says in Thessalonians, let him that does not work not eat. Well now, if you take that as a universal truth, that means of course that babies don't get to eat because they're not working, or the elderly don't get to eat because they're not working. Well, we don't do that of course. We say that's nonsense, but the only reason we don't do it is because we find other things in the Bible that tell us to care for the infant and care for the older, and that we know won't contradict what Paul says about let him who does not work not eat. And so we limit the meaning of Paul's words to the situation in the Thessalonica and their particular circumstances because of the rest of the Bible. So we sometimes have to work hard to figure out how these different situationally oriented statements in the Bible are compatible with each other on a higher level. And those are the kinds of the ways we can go at this thing. Does the Old Testament have statements that appear to be contradictory? Student: Richard, some of the examples you just used were from the New Testament, but could you talk a little bit more about how the Old Testament has examples of that? I think about in the Pentateuch with the Israelites, if you could go into that a little bit. Dr. Pratt: Well, let's put it this way. A lot of people would say that the Bible teaches that God is immutable, that he's unchanging. Okay? And you can get a lot of that from the Old Testament, several passages that say that, I do not change. Well, if you were to take that statement there and compare it to things that go on in the Bible itself in the Pentateuch, then you're going to run into some problems, because God seems very much to change. In the days of Noah he was grieved that he even made man. It grieved him. Okay? And so you get these kinds of things coming up all the time. When God is determined to destroy the Israelites at Mt. Sinai, Moses says please don't do this, in Exodus 32, and then God does not carry through with what he said he was going to do, which was to destroy them. And so, does God change? Well, the theologians say, of course, first God is immutable. But then what they do is, they in the fine print, will explain that this doesn't mean that God is unchanging in every way you could possibly conceive of God being unchanging. God in the Bible obviously does things. He is, in fact, what the theologians called often pure action, he's always in action, but he doesn't change in certain ways. And so theologians, systematicians, tend to try to identify what those ways are. And so they'll say, God is immutable in his character, so he doesn't change from being loving to being hateful, or from being just to being unjust. That never happens. If he's just, he's just. He's always that way, always will be that way. He doesn't change not only in his character but his eternal plan. And not only his eternal plan, some theologians add to that his covenant promises. They are immutable. They don't change once they're set up, once they're said. And this is where understanding that systematic theologians are not ignorant of the Bible is very important. Sometimes we will get ideas from quick summaries that we hear, like God is immutable, and we won't realize that the theologians themselves have dealt with the Bible, too. They know that that can't mean that God doesn't grieve over having made humanity, that God can't say to Moses, well, I'm going to destroy them and say, well okay, I won't, because he does that. And that would be something that theologians would want to account for as they refine the definition of immutability. So it's just very important to remember that a quick snapshot of what a systematic theologian says about any doctrine may not be everything that they take into account in the fine print of their discussions of it. What is the law of non-contradiction? Student: Richard, you talk about in the video about the law of non-contradiction. What is that exactly? And how are we supposed to use that in our ministry? Dr. Pratt: I wish we could say what it is exactly, because logicians and systems of logic through history have described it in different ways. Now, the natural tendency of most traditional systematic theologians is to define the law of non-contradiction along the lines of Aristotle. And I don't remember his precise way of putting it, but it amounts to something like this: That something, say "A", cannot be both "A" and not "A" at the same time and in the same sense. Okay, now that's a mouthful. Typically symbolic logic will symbolize it as it is not case, a little squiggly not (PN not P), which means same thing. But the reality is that different forms of logic, and there have been many of those… in our day we have what's often called fuzzy logic or multivalent logic, and that means that you don't just have yes and no or correct or incorrect, but you have a variety of in-betweens as well. The law of non-contradiction begins to become a whole lot more complicated. But let's just stick with this basic idea that something can't be and not be at the same time and in the same sense. Well, most of systematic theology is guided by that principle. Okay? And that is why you find systematicians working very hard to take things in the Bible that seem to violate that law, and they do seem to violate them at times like, Jesus is God, Jesus is man. Well, if there was ever something that is "A" and "not A", it would be to say that this person here is God and man. So that would appear to be a contradiction. So how do you keep it from being a contradiction? Well, you have to either say he changed from one to the other, so he was at different times, or you have say there were senses in which he is God and man, and so typically you will choose the sense. Because the only thing you have to do is explain just one sense, or one way in which "A" and "not A" are different. That's all you have to do. Just one tiny little sense, and you don't have a contradiction anymore. And so that's why sometimes you find systematic theologians refining their discussions very tightly right down to the nth degree so they can find some kind of way to distinguish things that appear in the Bible to be contradictory. And I think that's a valuable thing to do, so long as we don't go too far away from what the Bible actually says. And I think we have to give a sort of presumption of the logical nature of biblical claims. That doesn't mean that we can always show them, or that we can always justify how something is — "A" is different from "not A" in some sense or another — but we can work very hard to try to understand those things and to figure them out so that we don't sound like we're talking out of both sides of our mouths. But the fact is, when you're dealing with an incomprehensible God, sometimes you're going to sound like you're talking out of both sides of your mouth. You're going to say things like God is transcendent, but God is immanent. Well, which is he? Those are hard things to bring together. I mean, is he utterly distant, or is he utterly here. And the answer in the Bible is, yes. And both are true. Sometimes people in our circles will, in evangelical circles, they will make a mistake of thinking that Bible talk or Christian talk is always either/or. It's either this, or it's that. But the fact is that… and they'll contrast that with Hindu thought which they say is both/and. That's not right. The Bible does a lot of either/or, and the Bible does a lot of both/and. Okay? But it never truly contradicts itself, but sometimes it doesn't make it clear as to how it isn't contradicting itself. And sometimes we are just left with a mystery as to how those two things work together. How can we use the law of non-contradiction when we apply the Bible to our lives? Student: You know, we're talking about this again in a very high plane, and we need to. That' what systematic theology does, but how do I take this idea and communicate it to the person in the pew and give them assurance that when they see two things that are apparently contradictory, that you can still trust your Bible? Dr. Pratt: Yeah. That's great. Well, can we take it down even lower to real life? You tell people that if they love Christ, God will make them their children and that God loves his children. Okay. And that creates certain expectations, certain logical expectations, because if we know what love is at all, that means that God is going to do good things for you, and he's going to bless you, and those sorts of things. And then that same person who is a child of God and who is loved and being blessed by God ends up with a debilitating, horrible, terminal disease. At times like that then they wonder to themselves, does God really love me? And that also raises even questions and doubts about whether there even is a God, and whether the Gospel is true, and so on and so on. And a lot of that stems from the fact that Christian leaders don't help people understand the nuances of what it means to say that God loves us and that God blesses us. And if we were able to teach people ahead of time what the small, fine print nuances are on this, it might help them deal with the realities of life as they face them. I know several people that have gone through horrible divorces, Christian people, and they say to me, Richard, if God loves me, why would he have ever allowed that to happen to me? I have friends who are sick who are going to die from their illnesses, and they sit there and they say, how can a loving God do this to me? The problem, of course, is that we're defining "loving God" in a non-biblical way, and we are extending that definition to all kinds of inferences and implications that the Bible doesn't encourage us to do. This was Job's friends' problems, wasn't it? They thought they had God in a box. If God likes you, then he'll give you blessings. If he's not giving you blessings, therefore, he doesn't like you. Okay? That made perfectly logical sense to them. The problem was, their premises were wrong; they were too limited. It's easy for me since I'm not terminally ill right now to say, well, one day God will show you so much blessing, you can't even imagine it. And in fact, you know, when that day comes in the new world, you'll look back at this time as just a blink of the eye. But still, it doesn't fit. And so we really need to be careful not to allow ourselves to be fooled into thinking that we have mastered a concept or mastered a premise in our argument, and as pastors and as leaders, we've always got to start bringing up these sort of exceptions, we might call them, the sort of "but." God loves you and God will bless you, but, not in this way necessarily or not in that way necessarily. And if we look at it closely enough, then the logical conflict that comes up, if we've taught it well, will disappear. At least it won't be a logical problem. There might be emotional problems with how can God love me and let this happen to me, but it won't be a logical issue. And that's the fault of the teacher who wants so much to be able to say things in simple ways and straightforward ways and give it in a nutshell, put it all in a nice little pill so you take it and go home with it without helping people understand the subtleties of real life with God. And so I think that in many respects, you're right. It makes us wonder whether the Bible is true and whether God is even there if we're not careful in the ways we formulate our basic propositions and then derive those implications, those logical implications, following the law of non-contradiction. What's the difference between induction and deduction? Student: Richard, in the video you talk about systematic theology's use of induction and deduction. Could you elaborate on that? Dr. Pratt: Well, it's a big one. Let me see if we can just do it this way. Let's define the terms again first. The first thing we need to say is that people don't define these terms in the same way, but basically, deductive logic is where the premises of the argument necessarily imply the conclusion. That means there is no if, ands or buts. So in other words, you're taking premises that actually contain all the information of the conclusion right there, and all you're doing is sort of drawing them out. Induction, however, has premises that have all kinds of information in them, but you are concluding something that goes beyond what's contained in them. You're making a probable, you hope probable, conclusion from a list of premises that you've made. Now that sounds kind of abstract and difficult, but maybe it's not quite as hard as I'm trying to make it here. I think a lot of us know from Bible study methods that are out there, very popular ones, a lot of people talk about the inductive Bible study method, and we know what that means. It means basically, look at Bible verses, read them, draw things out of them, and then put them together into a conclusion. And that's basically what induction is. It's taking particular items, particular beliefs, or particular truths, and trying to draw more general conclusions from those particular things. And the general conclusions go beyond what any particular premise or even the combination of all the premises will give you. What is the "inductive gap"? Student: Richard, you talked about the inductive gap in the video, and it seemed like something that was really important, but I'm not quite sure I got that. Could you go into that a little bit more? Dr. Pratt: Yeah, because it really is important. You remember, we have said that systematic theologians, just like do when we read the Bible and come up with theology, that we begin basically, though not exactly, though not in reality — we can say artificially — we begin by looking at the Bible and getting all this induction going on, and then we deduce things from that. Now again, those things happen all the time in a variety of ways, multiple reciprocities and so on and so on, but that's basically what happens. And that means then that the deductions that we make in theology are all based on inductions, so the sure conclusions that we draw, or the sure inferences we draw from what we think the Bible says, are based upon an inductive analysis of the Bible. And that's why the inductive gap is so important, because the inductive gap limits the ability of induction to come up with sure conclusions. Okay? So basically what we're saying here is that all of our deductions from the Bible are based on inductions in one way or another, and the inductive process has a problem in it. Alright, now what's the problem? The problem is that you always say more in your conclusion from induction than you have facts in your premises. It's just always true. And there are two basic kinds of inductions. Let me just say this because this will help us work with this. You have the repetitive induction, and I gave the example of geese flying. Remember that? You watch one goose fly by, it's white. Another, another, another, maybe watch 10 million geese fly by and they're all white, and you conclude on the basis of those 10 million geese, all geese are white. Well, that seems rather reasonable. I've watched 10 million of them. Surely they're all that color, and they all thought that they were so long as they were talking about Europe. But as soon as they got to Australia, they found out that not all geese are white. Whoops. Because all you have to have is one exception, and the conclusion is destroyed. All you have to have is one exception, and the conclusion's destroyed. Okay. It's the distance between the premises and the conclusion that is called the inductive gap, because you're always adding or assuming more than your premises give you. For example, if we were to look at the Bible and we were to say, Jesus says that if you pray in my name, you'll get what you ask for. And then you say, I prayed in the name of Jesus, and he prayed in the name of Jesus, and he prayed in the name of Jesus, and so we're all going to get what we asked for. There's a nice generalized conclusion. Okay. But the problem is that person A and person B are praying opposite things. One's praying for it to rain and the other is praying for it not to rain. Now who gets it in Jesus' name? There's the problem. Because what you're doing, is you're going beyond what the data can give you. And in that inductive gap in there, what we do to feel at ease, what we do to feel sort of psychologically at rest about it, is we fill that hole in with other things we believe. For example, take the geese example: 10 million geese have flown by, and what you do is you fill in the hole. Before you say all geese are white, you fill in the hole by saying, well, it must be the same way everywhere. And you fill in the hole by saying, that will be a sufficient number. And you fill in the hole by saying my eyes have not played a trick on me. You fill in the hole by saying no one else has reported any other color of a goose anywhere in the universe. Okay? And then those extra things that you don't even state in your inductive argument sort of make you feel at peace in saying the generalized conclusion that all geese are white. And that is the problem. That's where it really breaks apart. It's all those unspoken assumptions that you bring to bear on the argument that allows you to make that general statement that goes beyond what you've actually examined. So we'll look at the Bible and we'll see, for example, that the Bible says Jesus is a man here, Jesus is a man there, he's a man this way, he's a man that way, a man, a man, a man, a man. And so we'll draw the conclusion Jesus is only a man. Well, the problem there is not the logic. The problem is that we have not had the right data in there, okay? And we filled in the hole of the inductive gap with insufficient information, and it has led to the wrong conclusion. Then you might start deducing all kinds of things from that if you've gotten to the wrong conclusion. That's one kind of induction, is the repetition, and all you've got to have is just one exception that you may not have ever seen or ever experienced. You've got to find some verse in the Bible that says Jesus is God. Oops. Now you've got the exception. The other kind of inductive argument is what we call compositional, and what that means is that it's like pieces of a puzzle where you experience bits and pieces of a situation, and you draw them together, and you make a conclusion that applies to the whole situation out of the pieces. For example, I think we even use this illustration, don't we, that you see a friend come in from outside and he's soaking wet and he's got a wet umbrella, and you walk out and you see him in your hallway, and you conclude therefore it must be raining. Well, not necessarily. I mean, it's a logical conclusion. Maybe you heard thunder. Maybe 5 minutes before you looked out the window and it was raining, and now 5 minutes later the guy comes in, he's soaking wet, the umbrellas wet, and you conclude it's raining. Well, not necessarily, because all you have to do is have somebody on the roof of the house with a garden hose, who is spraying water down on the person after the rain stopped, and you're tricked into thinking that it's still raining. That's the inductive gap. And we fill in that inductive gap with all kinds of things that we don't even realize, like, if it was raining 5 minutes before, it must be still raining. Those kinds of things. Or I heard thunder; that means it must be raining. And we know those are not necessarily true, but we fill them in anyway, and we make these things connect in ways that are beyond the data that we actually know. And this is the problem with Bible study. This is the problem that even systematicians face, and it's why you don't just have one systematic theology that stands forever. It's because systematic theology is based on induction, and that means it can always be improved upon by somebody bringing up a bit of fact that nobody had thought of before. So that's typically what happens, that a systematic theologian will talk about what guys in the past have said, and then they'll say, but, now listen to this verse. Oops. Now here's another piece to the puzzle, and now we've got to factor that into the induction conclusion that you bring. Have you ever made a mistake like that, thinking that a situation is a particular sort and then found out that you didn't have enough information? Dr. Pratt: Yeah, I mean, this is just the way it happens. This is life. And that's what happens in systematically theology, too. And as we build systematic theology, it's always good to lean on other people who are experts but never accept that they have gotten all the data together, because they haven't. That's not possible. And we always have to be asking the question, what is it about this person, his background, his theological assumptions, that he's not stating that's filling in that hole of the inductive gap? That's the key, and that takes a little bit of mindreading to be sure. It takes a little bit of historical referencing, because when you are dealing, for example, with people in the earlier stages, say the Neo-platonic stages of systematic theology, they're going to have all kinds of philosophical beliefs and beliefs about the world and beliefs about God and things like that that are filling in the inductive gap that you don't share anymore, that you don't even believe in. You might not even be aware of them, but if you become of them, you don't believe in them anymore, and that's going to affect the conclusions that you draw. And so it's just very important always to remember this. Now, some people are scared to death, absolutely scared to death when they realize that their Bible reading is never comprehensive. Because that's what it would take. You would have to know everything about the Bible and everything about general revelation, because that also impinges on this, in order to be sure that you're not making the wrong jump over that inductive gap, to be absolutely confident, and that would turn it then into a deductive argument, okay? So the conclusion would be necessarily held in the premises themselves. They're thrown into a tailspin sometimes, because they're so scared that what they're getting from the Bible isn't sure, isn't firm, isn't certain. Well, when people get that way, I usually say to them, welcome to the human race, because this is the nature of being human. We are finite, and we cannot account for all the facts. And what we can do is do our very best and be responsible in the ways that we handle these things. The inductive gap can be very large, or you can narrow it. Okay? And the way you can narrow the gap is, one, by getting more data. Okay? So that sort of closes the gap a little bit. And the other way you can lower the gap or make the gap smaller is by lessening your conclusion, not making it so extreme. Okay? You can work at it in both ways. You can say, well, you know, I believe this is true, but I won't make it quite this big, or let me go back and read the Bible again. That can make the inductive gap a little bit smaller, but it's never going to go away absolutely. And so that means then all the inferences, all the deductions that we make from these propositions and things that will imply this and imply that necessarily, are all based on these faulty inductive arguments that we've made from reading the Bible. And that is why we believe that theology ought to be reforming all the time. It's why we think we always need to go back to the Bible and judge what theologians have said. It's our only absolutely unquestionable authority, and that means that every theological proposition ought to be questioned. Every theological proposition needs to be refined. If you allow one of them to be perfect and unrefinable, then you've taken a theological proposition and you've made it equal to the Bible, and that we don't want to do. Otherwise, we make our theology equal to the scriptures themselves, and that's contrary to the whole notion of what it means to be a Protestant. And so it's just very important. Have you ever seen people… have you ever experienced, let's put it this way, where you thought that you had a firm and a full grasp of a Bible teaching on some subject and then found out later you didn't, that you didn't account for a particular verse or something like that? Student: Oh certainly, certainly. My own understanding of theology has changed so much since I first became a Christian. From one extreme to another in some cases. Dr. Pratt: Me too. You know, I remember when I first became a believer, I read a few verses in the Bible that said to me — I understood them to say because other people were telling me this — that Richard, if you'll just believe hard enough, you will be well. Okay. And they had a couple of verses that indicated that that was the case. For everything I could tell, that's what they said. So I agreed with the conclusion. All I needed to do was believe. And I remember I had poison oak on my face and my face was swollen out like this. And I can tell you honestly, I believed so strongly that I was going to be well, that I challenged God and said, I'm going to believe you now, and I firmly believed it, and I spun around… and I said, Lord, when I come back and look in this mirror again, I'm going to be well. And I spun around and looked in the mirror again and I wasn't well. I had friends that took their glasses off and threw them away because they believed that they were healed. Well, see, the problem there was not the belief. It wasn't the faith. The problem was that I had not gathered enough data from my inductive conclusion from which then I deduced certain things for my life. And so it's just very important both on the systematic theology level and practical level, always to be aware that there's more to learned, and if things aren't working our quite the way you thought they were supposed to work out, it could very well be that you haven't gotten all the data of the Bible into your induction because of that inductive gap. How does the Holy Spirit help us to bridge the inductive gap? Student: Richard, how does the Holy Spirit help us in bridging this inductive gap? Dr. Pratt: He does, and I think it's really important for us to realize that. Basically, what we're saying at this point is that theology is not a matter just of logic, that it must remain a very personalistic thing, and that if we reduce this whole process to induction followed by deduction and things like that, just get the rules right and you'll be led to the correct conclusion, then we are missing the point altogether. I think that the most visible way, or the most obvious way that we can emphasize how much we need the personal ministry of Holy Spirit is in the fact that we have this inductive problem, that we've got this gap, that we are just never going to be able to get all the data of the Bible, much less add to that all the data of general revelation, into our brains at any moment, and then just think logically and churn out the right answers. It's just not going to happen. And so how do we then live without just giving up? And I think the answer is that we have to, we are forced to, we're compelled by this, to go to Holy Spirit's leading. You know, the Bible does not encourage us to think logically and everything will be fine. The Bible encourages us to walk by the Spirit, to be led by the Spirit. Now being led by the Spirit and walking by the Spirit doesn't mean that you don't think logically. It just means that you, as it were, baptize and renovate and refresh your thinking processes by the power and influence of Holy Spirit. And that brings in then issues like intuition, emotional issues, conscience, and things like that, where the Holy Spirit works within us, leading us in imperceptible ways, in ways that might even seem opposite of what we might conclude logically. And that is a matter, however, of every theologian becoming very personal in their theologizing. It's a difficult thing to express, because, unfortunately, systematic theologians have not talked about this enough to give us good vocabulary for it, and because they do tend to emphasize the logic and the ways of reasoning through things. But in reality, the best of theologians have always done this. They have always come to the point where they have to lean on the personal ministry of the Holy Spirit to convince them that what they are saying and what they're believing is right. And we must never allow ourselves to reduce systematic theology just to logical conclusions. And the evidence again for that is that inductive gap that never goes away. Somebody's got to fill in it, and I think that the way you fill it in is by prayerful devotion to Him who is our teacher, to Him who is to lead us into all truth, to Him who empowers us even to see the truth, who illumines us to know the truth. And if we ignore Him, and I mean personally ignore him and just assume he's in the background working around, then what we're going to do is miss the most important piece of coming to conclusions that we can live with. And of course, we often misperceive the leading of the Holy Spirit, don't we? I mean, we do things… we draw conclusions out, we come to conclusions that we found out later were wrong. And that does happen in sincerity, but I think responsible theology comes from sincerely adopting what we believe to be true of the Bible, influenced then and confirmed by the work of Holy Spirit in us. Have you ever had a time when you thought the Holy Spirit was leading you to something and found out later it maybe wasn't quite the way you thought it was? Student: Absolutely. I remember being so convinced that the Holy Spirit was calling my wife and I to the mission field, so much so that we had folks praying for us, and we actually ended up moving overseas. After a few years, learning a little bit more about who I was, and who my wife was, and our gifting, and the skills that we had, and as the Spirit revealed more things to us, we realized that that wasn't exactly what he was calling us to do, and we actually made another move to come back to the States in a different way. So it's very true what you're saying. Dr. Pratt: Yeah, I think so. Because, you know, I wish that we could have a vision where the Holy Spirit would come and just answer all our questions, but he usually doesn't do that. He usually works where we are. But I think that raises then the issue then of the difference between having right theology and responsible theology. See, that's a big difference, because I think ideally we think of systematic theology as leading us to the right answer. And in some respects that' true. I don't want to deny that completely. But I think a better way to think of it is that we come to answers that are responsible, and by that I mean all the things we know about the Bible, and all the things we are feeling from Holy Spirit, and the leading of the Holy Spirit as best we can understand that, and the situation that we're facing — you just mentioned yourself, your knowledge of yourself — you've done the best you can, you're being responsible, and you make the choice based on that, but always being able to say later on, well, I didn't quite get it right. That's responsible theology. Otherwise, you know, if you have a good systematic theology, you don't need any more. It answers the question. There's no issue involved anymore. But people always need to be revising their theology to be closer and closer to the Bible and truer and truer to the work of Holy Spirit. And so I think the goal here, even with that inductive gap, is responsibility not perfection and I think that's extremely important. How can we discern doctrinal emphases from doctrinal differences? Student: Richard, when we talk about differences among us in the Christian community, how can we discern between something that may be just a different emphasis, or actually a real disagreement like a doctrinal difference of some sort? Dr. Pratt: I think it's real important just to raise the question, because I think that when two Christians get together, or when Christian groups try to get together, the natural tendency is to want to say, we are right , they are wrong. I just think that's just sort of natural to people. And they don't even ask the question, could we both be right? Because the normal options are I'm right, you're wrong, you're right, I'm wrong, we're both wrong. Okay? But seldom do we come to the point where we say, well we're both right, but we've just got different angles on this, or different emphases on this. And of course, you know, we all would love to be able to say that our church or our denomination gets it all right and everybody else is wrong, so come to my church. And in fact, that's the way lots of Christians live their lives, is that they cannot even fathom the notion that maybe their own denomination or their own local church doesn't have all the right answers. Unfortunately, though, that's the reality. No church has all the right answers. And if we're going to promote cooperation among Christians without just giving up our convictions, giving up what we believe to be true, there are going to be times when we have to admit that they are doing something that's right, but it looks so different from me because they're emphasizing certain things. And that comes from cultures — different cultures get together. It comes from different groups within the same culture — they'll have different emphases. And it will look like they're contradicting each other, and they really aren't. Now there are real contradictions between different Christian groups, and we have to be sensitive to that and aware of it and know when to draw the line and put our foot down. But at the same time, we have to be ready to admit that we are emphasizing this, and we can go along with what you're saying, but we're not going to emphasize it the way that you are, we're not going to formulate it the way you are, we're not going to give the priority to it the way you are. And that would involve any topic in systematic theology, any doctrine. And the question would then be, is what this person or this group is saying compatible in some way with me and what my group believes, or is it truly contradictory? Oh it different, that's obvious. Okay? But is it compatible or contradictory? And if it's compatible in some fashion, then I think we need to emphasize that it is compatible, but at the same time, realize there are lots of truly false teachings out there that we need to stand against. I mean, for example, if somebody says, well, I don't believe the Bible is really the authoritative Word of God. Well, I don't know how I can make that compatible with believing that the Bible is the authoritative Word of God. That would be a hard one to do. Student: That goes back to non-contradiction. Dr. Pratt: That's right, exactly. Exactly. And so, you know, it's either one or the other now. It can't be both in the same sense, the same time. So I'm going to have to stand against that because that's a fairly clear delineation between the two of us. Now if somebody says to me something along the lines of, well, I believe that we must lean upon the Holy Spirit to guide us through life, and that's all they want to talk about is the Holy Spirit's guidance and that sort of thing, and in my church the tendency is to say learn Bible principles and that will guide you through life. Well, they seem very different. They seem incompatible. But when you work at it a little bit, you can begin to see that really those two sides of the same coin are both important to us. So they're different but compatible and not contradictory. Have you ever known of groups that have had things go on that they think are absolutely contradictory against each other but you believe are just compatible differences of emphasis? Student: Well, I can think in my own life early on, just being involved in worship, I myself had an idea of what was the right way to do this, and as I've gotten older and hopefully a little bit wiser, I've begun to realize and see that these really have been issues of emphasis more than something that I needed to be really staunch about. Dr. Pratt: Yeah, you know, and churches split over these kinds of things. Right. It's just amazing to me in many respects that churches will always go through these things, especially as you go generation to generation. You're always going to have the younger generation wanting to do things differently than the older generation did, and it's always going to cause some tension. But for the most part, even though there might be some real contradictions there, for the most part, they are compatible beliefs, compatible ways of worshiping with different emphases, and if we could just begin to talk that way about it, we might actually be able to come to some resolution, some kind of temporary blending of the two that then moves later on, rather than seeing churches split over such things, and actually see them love each other through such things. But that takes a lot of effort, especially — I hate to say this, but it takes a lot of effort from the younger ones, a lot of effort, because they have to back off and say, okay, I would rather have this in worship, but we have in worship from the older generation is not contradictory of this. They're not mutually exclusive. And what I can be satisfied with is loving my older brothers and sisters and a little bit of movement my way. And I think that's the kind of thing we're talking about. And as the church of Christ becomes more and more globally minded so that as the earth has flattened out, that what happens over here affects what happens over there, and over there over here, we're not separate from each other — we're not just going to face this from generation to generation, we're going to face this with immigration, we're going to face this with ethnic groups, ethnic minorities and the like, saying it's now time to respect our opinions on these things, too. And that happens all through, not just worship and practical matters like that, but happens even in the theoretical emphases of systematic theology. As those things come up, as the changes come up, the question is always going to have to be, are these compatible, or are they truly contradictory? And to answer that sometimes is a hard thing and takes a lot of work, but it is the crucial answer, the crucial question to which we must come up with an answer. Dr. Richard L. Pratt, Jr., the President and founder of Third Millennium Ministries, is adjunct professor of Old Testament at Reformed Theological Seminary and a visiting professor at Covenant Theological Seminary. He is an ordained minister, and travels extensively to evangelize and teach. Richard received his B.A. from Roanoke College, studied at Westminster Theological Seminary and received his Master of Divinity from Union Theological Seminary. He earned his Th.D. in Old Testament Studies from Harvard University. Richard is the general editor of the NIV Spirit of the Reformation Study Bible and a translator for the New Living Translation. He has also authored numerous articles and books, including: Pray with Your Eyes Open , Every Thought Captive , Designed for Dignity , He Gave Us Stories , Commentary on 1 & 2 Chronicles and Commentary on 1 & 2 Corinthians.